Richelle Mead knows how to deliver. In Bloodlines, she created a fascinating backdrop where vampires masquerade among humans at a boarding school. A prominent Moroi royal is in danger and is being hidden here in Palm Springs. Sydney the Alchemist is tasked with concealing the identities Jill and the other moroi and dhampirs. It makes for some great plot lines, but who am I kidding? Why am I really reading this series? Two words: Sydney. Adrian. Like Bloodlines, The Golden Lily is not centered around action. Sure, there are fights sprinkled throughout the book and a big blow-out at the end, but it's really framed around developing Sydney and Adrian's relationship. This is done partly by highlighting how S/A's chemistry contrasts with Sydney's new boyfriend Brayden. Brayden should be Sydney's soul-mate. Brainy in the unrealistic extreme, he and Sydney immediately hit it off. Brayden may share Sydney's nerdy intelligence but he lacks her capacity for self-sacrifice and empathy. They have a great time together, but even Sydney can sense that it's not clicking. Definitely not like she and Adrian connect (although clueless Sydney never thinks about that). I continue to love Sydney. I relate to her much more than I ever did Rose. It's wonderful that she's not ashamed to be intelligent, but unlike Brayden, doesn't come off as arrogant. A lot of people complain about her obsession with her weight, but I think it's a great addition to her character. Sydney expects perfection of herself in everything. When she's hanging around moroi all day who are so much thinner than she is, it's natural to feel like you're failing - even if she knows that moroi's willowy body type is unrealistic. Another great addition to this series is the exploration of witchcraft - human use of natural elements to craft spells. It is yet another opportunity for Sydney to challenge the Alchemist rules with which she has been indoctrinated. And comes in very handy. I'm looking forward to seeing Sydney fully embrace spells in future books. One thing I did find odd about this book was the timing. The entire first book took place in a month. This book is an additional month. It feels unrealistic that so much could get crammed into a single month. Both with all the varied plots and the build-up of relationships. Another potential criticism of the series is that it feels very predictable. I think I can guess how the rest of the series will play out. Maybe I'll be proven wrong, but I wouldn't be surprised if I largely know what's going to happen. Not that I care. I want to see just how my fantasy Sydney/Adrian story will occur. The Bloodlines series is candy. It is somewhat formulaic and does not have a huge amount of substance, but you just can't get sweeter than Sydney and Adrian's romance. Candy or not, I tore through the pages of this book and will happily re-read it to relive the magic. I cannot wait for Indigo Spell to come out in February. I still need to read Vampire Academy! But what's definitely encouraging about reviews I've read for that series and your review here is that it seems like Richelle Mead definitely knows how to craft a fun, addicting book. Candy can be good sometimes! I'm glad you enjoyed this as I did too! 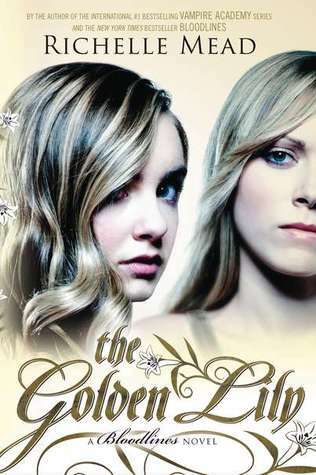 I thought The Golden Lily was really good, even better than Bloodlines. I like Sydney and Adrian too, and dislike Brayden. I agree that it's a bit predictable but that's ok because it's a lot of fun, right!? I pretty much adore everything Richelle Mead writes but I have to say this series has become my favourite, more so than my first favourite of all - Vampire Academy, which is really surprising considering NOTHING could beat my love for VA. Anyway great review! Glad you enjoyed it too. I LOVED Golden Lily! and the end?!?! OMG ... I sooo need to read the next book as in right now! I haven't read this series but I do love Richelle Mead. Does sound like there's an awful lot that went down within just a month but maybe life in this world is just so much more exciting than our real one...heh. I love Sydney and Adrian's relationship so much better than when he was chasing after Rose. They compliment each other, yet are different enough to keep things interesting. I can't wait to see where they end up. I'm glad that you enjoyed this book! I think it was much better than Bloodlines, so I'm hoping the next book will be even better. And it is predictable, but I overlook that fact because I love Adrian Ivashkov so much!